Inventory We are a resale marketplace, not a box office or venue. Ticket prices may exceed face value. This site is not owned by Meadowbrook Pavilion . 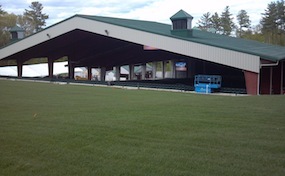 Bank of New Hampshire Pavilion at Meadowbrook opened in 1996 as the primary outdoor concert venue in New Hampshire. Meadowbrook as it is now called has already gone through a variety of name changes from Meadowbrook Farm, Meadowbrook Musical Arts Center, and also Meadowbrook US Cellular Pavilion. The amphitheater has a seating capacity of 8,300 and recently upgraded another 3,000 seats by putting them under cover. Meadowbrook tickets generally are sold only during the summer months and attract some of the big traveling summer concerts. Meadowbrook.PavilionGilford.com is not currently affiliated with any primary box office, venue, or official site. We are an independently owned and operated company that currently concentrates all our efforts into the online resale of all tickets in the secondary market. Prices on our sites may fluctuate well below or above face value and can change quickly with market conditions. To order tickets for all Meadowbrook events please follow the steps online or call our friendly operators with any further questions.